Road trips are the most thrilling experiences to travel to beautiful destinations in India. They provide an opportunity to explore, experience & enjoy something new always. Now you can hire a car while visiting your desired vacation spot, at reasonable prices. So, why not sit back & enjoy the ride in our luxurious cars to your destination? You’re in full control of your travel plan. Stop, shop & eat anywhere you want without any time boundation. No matter where you travel, Footloose Car Rental is always there at your service. We ourselves like to travel through roads & live for the surprises. Footloose Holidays has all the cars you need to make your trip comfortable with your family. Hire luxurious sedans, SUVs/MUVs & hatchbacks as per your needs & travel to your destination safely. You can also opt out for large traveler vehicles/vans if you’re traveling in groups or family. This will make sure that you all travel together & enjoy your trip to the fullest. We also provide car rental services for all of your travel itineraries. 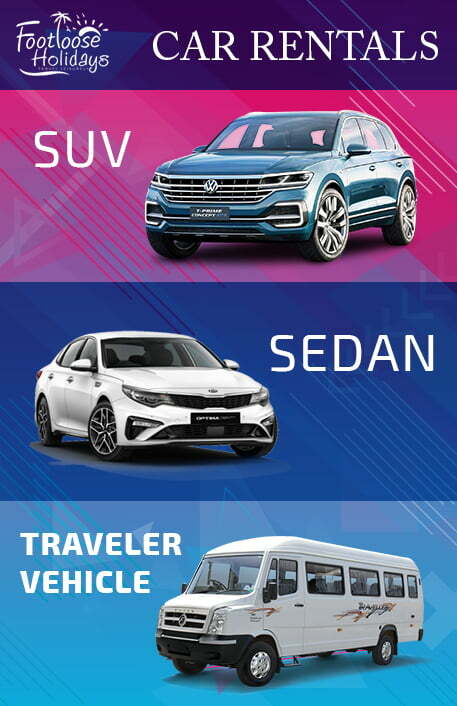 SUVs: We have a range of SUV cars like Scorpio & Innova which are useful when you need to travel in a group of 5-7 people. Luggage can be easily carried without hampering any seating space. SUVs are comfortable & good for off-road trips. Sedans: Sedans have a seating capacity of 4-5 people. Cars which we offer are Dzire, Etios & other same types of sedans. These cars have a large boot space to fit luggage easily & are great for long trips as they are very comfortable. Vans / Traveler Vehicle: A group of more than 8-9 people can easily fit in a large traveler vehicle or van. Traveler vehicles are good for long trips & are a better option than hiring 2-3 cars for group travel. These are available in 12-15 seater or more than 15 seater options. We have our service in almost all the cities of India. We are focused on making our customers’ travel more thrilling, exhilarating & enjoyable. Book your car now!